Surface: mostly gravel/dirt. Rough sections. Includes some creek crossings. Gravel-type bike recommended. Wide tyres will help. 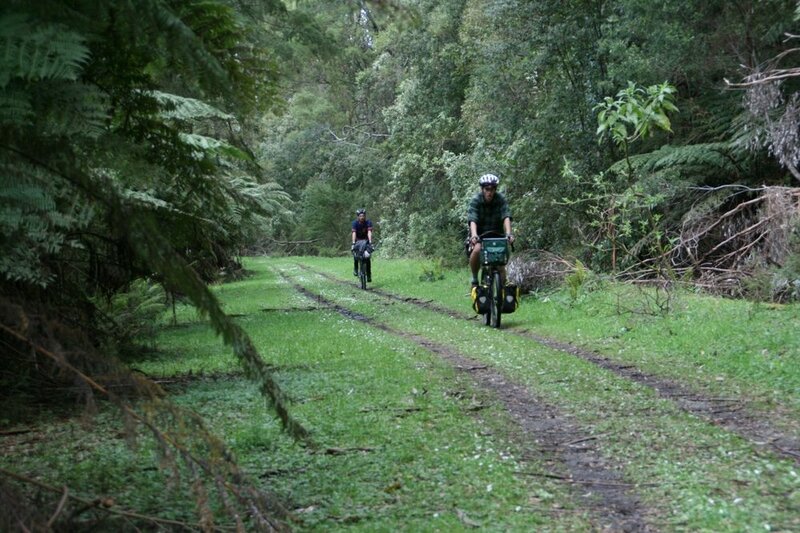 This ride takes you through the lush Yarra Valley, the heavily-forested Yarra Ranges, and rural areas of the central district. There's plenty of climbing, and plenty of gravel, with very little traffic for the great majority of it. Starting out on the Lilydale-Warburton Rail Trail, take a left onto Don Road at 28km, which will intersect with the O'shannassy Aqueduct Trail at around 33km. 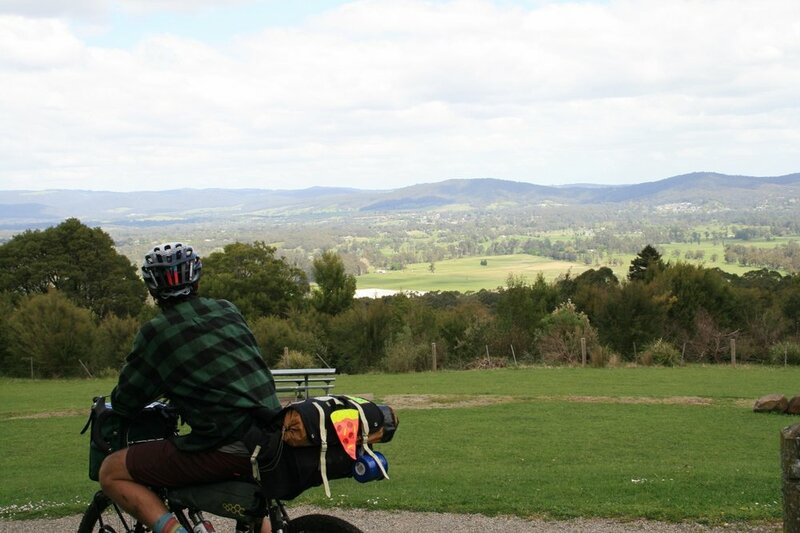 The O'Shannassy Aqueduct Trail is a stunning shared-use trail that is perfectly flat for much of the time, and winds through temperate rainforest with views over the Yarra Valley. You will come to Woods Point Road at 55km, near a redwood plantation which is a really cool place to have a walk around, and would make a good spot to bush camp. If you wish, you can skip the O'shannassy Aqueduct Trail altogether by staying on the Lilydale-Warburton Rail Trail all the way to Warburton, and continuing on through to Woods Point Road. This is a shorter and easier option that is still very lovely. A bit further on, the road angles up for the first big climb, which takes you high into the Yarra Ranges. This climb goes on for a while so settle in. Take a right when you get to the intersection with Marysville-Woods Point Road, and soon after take a left onto Big River Road. Big River Road is all gravel, varying from well-made to pretty rough, with plenty of small and medium-sized climbs, and some creek crossings. It's fairly remote, but you can get water from the river at regular intervals, and there's plenty of camping spots scattered along the way, many with drop toilets. Although you can never guarantee the quality of untreated water, the water in Big River generally seems quite clean and was ok to drink when I did the ride. After about 60km, you will come to Eildon-Jamieson Road, which is sealed. Take a right, and soon after you will start the second big climb. The winding descent is heaps of fun, and at the bottom is Wrong Side Brewing to reward your efforts. The ride from here to Mansfield is the only stretch where there's much traffic, and also includes a few smaller climbs. On the outskirts of Mansfield you'll pass Social Bandit Brewing, and from Mansfield you'll take the Great Victorian Rail Trail all the way to Tallarook, 120km away. 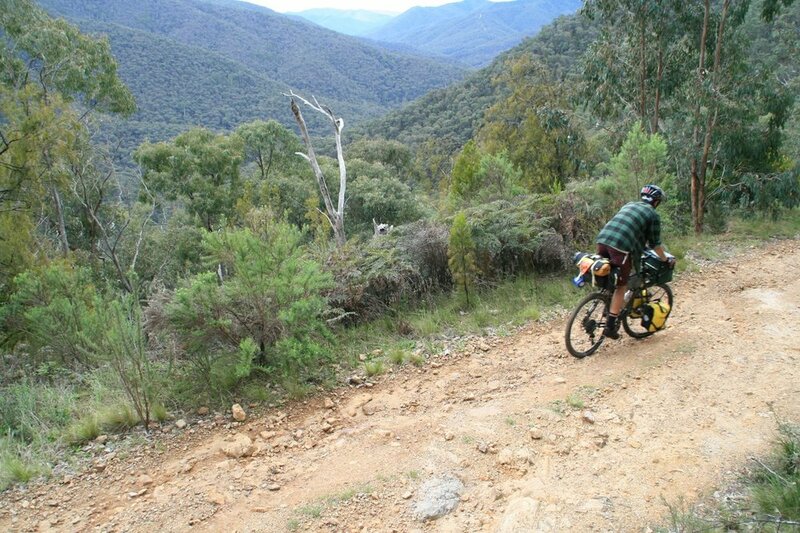 On the rail trail you'll pass through a few small towns, as well as the most northerly arm of Lake Eildon. It's pretty flat, mostly rural pasture-land, which is green in the cooler months and tends to brown off in summer. The trail is often quite exposed to the sun, so be prepared for this if you're riding it in hot weather. 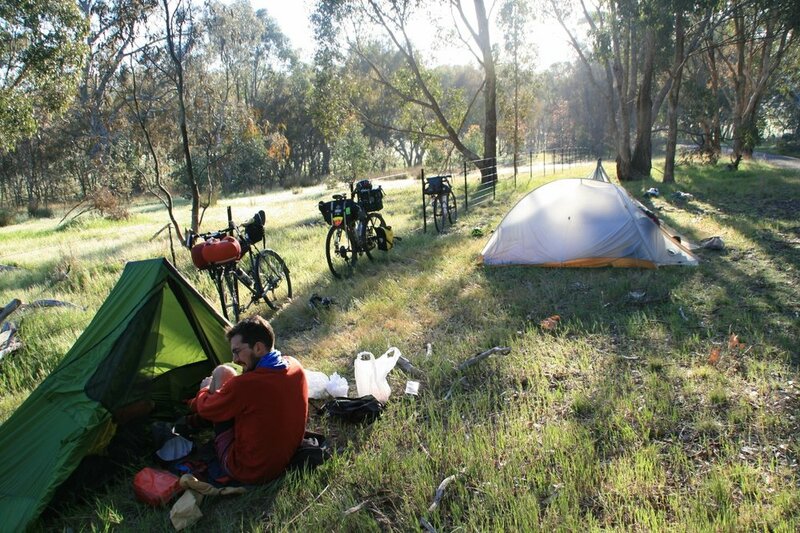 Free camping among beautiful eucalypt forests at many spots along Big River. Many of these have toilets, and access to the river, which is great for a swim on a hot day. Although you can never guarantee the quality of river water, it generally seems fine for drinking. Redwood forest near East Warburton - good spot to bush camp. Also fun to have a walk around in. It's both spectacular and a bit creepy - kind of Blair Witch-esque. Some historical artifacts of an old gold-mining settlement at Enochs Point, as well as a waterfall. This is just off Big River Road at around 131km. Wrong Side Brewing, Jamieson. Fine ales and pizza. Social Bandit Brewing, Mansfield. More fine ales, more pizza. Can be done at any time of year, but keep the following in mind: during winter it can snow at the elevations you reach in the Yarra Ranges. It's generally pretty brisk up there. Also, the Great Victorian Rail Trail can become pretty hot riding in warm weather, as it's exposed to the sun in many parts. The start, Lilydale, can be accessed via the Melbourne Metro train network. The end, Tallarook, is on the Seymour train line, operated by V-line. Trains run roughly hourly along this line. With both of these services, it's always good to check ahead for service changes due to planned trackworks etc before you leave. The following three maps all cover parts of the ride. Unfortunately I couldn't find anything that covered the whole thing. Surface: sealed & well-made gravel. Can be done comfortably on a road bike, though some may prefer a gravel bike. Surface: about 50/50 sealed/unsealed. Generally well made surfaces, occasional steep/rough sections. Gravel-type bike recommended. What: stunning temperate rainforest, good climbs, fun descents, beaches, waterfalls, food, wine, beer, cider, raspberries. Disclaimer: should you choose to cycle this route, you do so at your own risk. Although all reasonable efforts have been made to ensure its accuracy at the time of writing, Adventure Cycling Victoria cannot guarantee that the information herein is 100% correct. The information published is meant as a guide only, and should be combined with your own due diligence and planning. 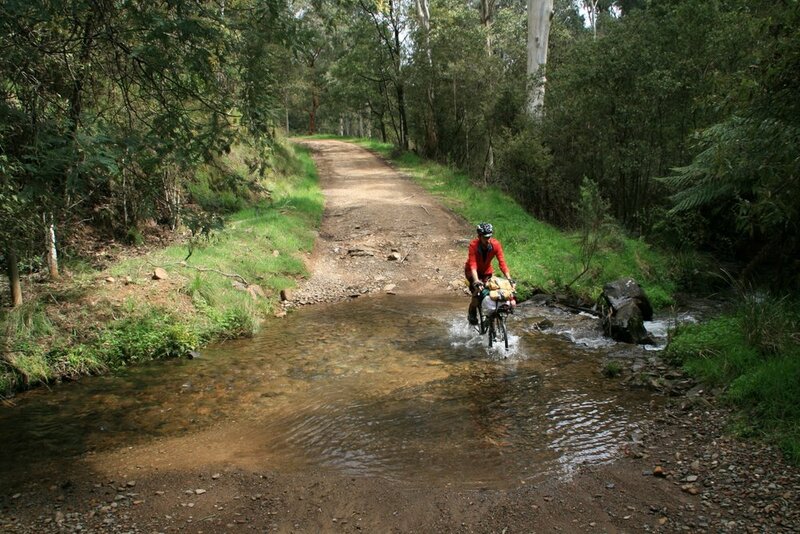 Adventure Cycling Victoria and its contributors are in no way liable for personal injury, damage to personal property, or any other such situation that might happen to individuals following this route.